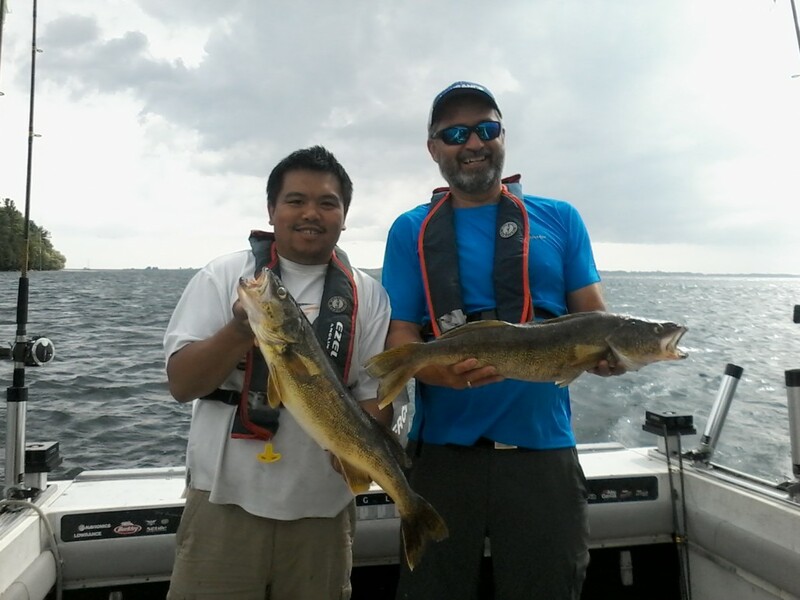 I first met John and Suzette Chang through our local Walleye league. Not only were they competing together in every event, they led the organization of our club’s yearly kids ice fishing derby. Several years back they took their love of Walleye fishing to the next level with the purchase of a 25-foot fishing boat that they overhauled and renamed, “Fresh off the Boat”. 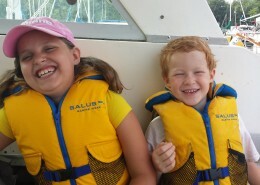 The boat is kept docked on Lake Ontario where the couple along with a partner offer daily charters. 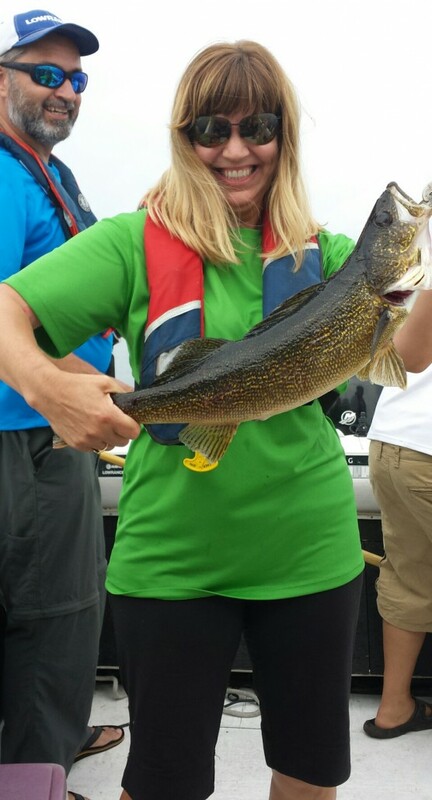 When my family received an invitation to join John and Suzette for a day of trolling for Walleye, we jumped at the chance. We were hardly out of the marina before Suzette took over the wheel and John began running out planerboards – three on each side. We were trolling cranks over water that averaged 35-feet in depth. As John predicted, within minutes after he passed out the food he had only just prepared using the boats on-board BBQ, planerboards started to drop back. 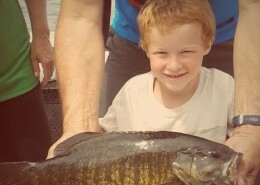 My wife and our youngest two kids, aged six and eight, had plenty of fun reeling in 6, 7 and 8 pound Walleyes, with a chunky 4.5 lb Smallmouth caught by my son for good measure. Walleye of this size in most parts of Canada would be older fish well into their productive years, but on Lake Ontario, range in age from three to five years. John and Suzette routinely boat Walleye that push the mid-teens. The highlight of the day was a drag-ripping call-to-action take on the left inside planer board. John pulled the rod out of the holder and called my name as next up. According to the Tekota’s line counter there was 352 feet of line separating me from the fish. After an initial short but intense run, the fish stopped dead in the water. Unfortunately, the forward progress of the boat meant Line just kept coming off the reel. 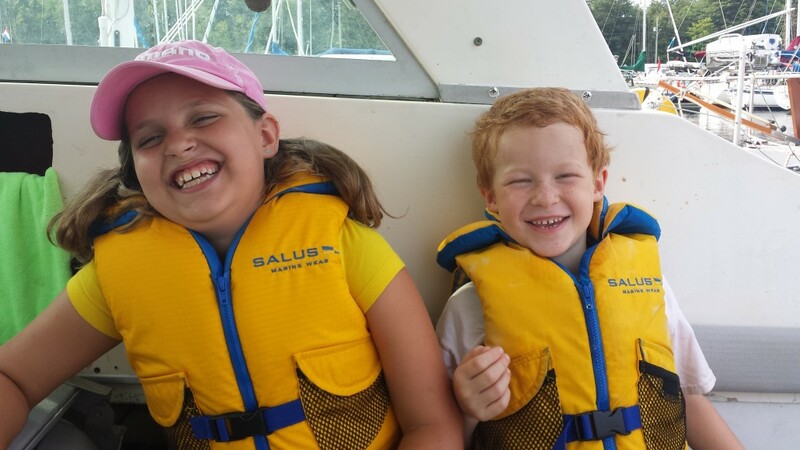 To avoid spooling the reel, Suzette had little choice but to take the boat out of gear. We knew it wasn’t a salmon because the initial run wasn’t that long. John speculated that maybe the crankbait was snagged on bottom, but even through the elastic stretch of the mono I could tell that whatever had my line was alive. Eventually, with gentle pressure and coaxing from my end, the fish slowly turned towards the boat. 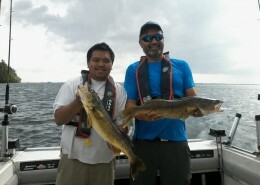 Over the next 20 minutes I managed to reel about 100 feet of line in – enough for John to remove the planerboard. That still left 250 feet or so of line to go. It was then that the fish showed itself for the first time. I wasn’t sure what to think when John saw the back of the fish. He was convinced that it was either a Sturgeon or a Musky. Whatever it was, I’m pretty sure the fact that it was hooked to my line hardly registered in its predatory brain. What I did know, based on John’s reaction and my limited ability to move the fish, that it was big. To keep the other lines from tangling, especially the outside line on the right that was also showing signs of fish-on activity, Suzette put the boat back in gear and began slowly moving forward. Over the next 30 minutes or so I managed to recover another 150-feet of line. This left 100 feet of 10 lb monofilament line separating the monster fish from me and, hopefully, the net. We still weren’t sure what we would do even if we were able to get the fish to the boat. John was convinced that there was no way he would be able to fit it into his 30-inch hoop landing net. What choice did I have but to continue to carefully take in line when possible, and just hold on when the fish refused to give another inch. With 60-feet of line still to go, the fish adopted a position directly below the motor. Suzette said she could see the fish on the depth sounder as a steady line. My nine-foot medium-heavy powered trolling rod was bent 180 degrees straight down. It became clear that while the fish was willing to join us for a cruise, it had no intention of coming aboard. About 50 minutes into the fight, things changed dramatically. The feel at the end of the line became electric as the line started to sweep upwards. John began yelling, “It’s coming up, it’s coming up”. For an instant I thought I was in a re-enactment of the movie Jaws. The fish made three dramatic leaps behind the boat as it angled to the left and back. It cleared the water by at least four feet. After its third and final display of acrobatic prowess, the line separated and flew back in our faces. The fish was free, or so we thought. My wife, John and Suzette all had a good look at my fish. The consensus was Musky. 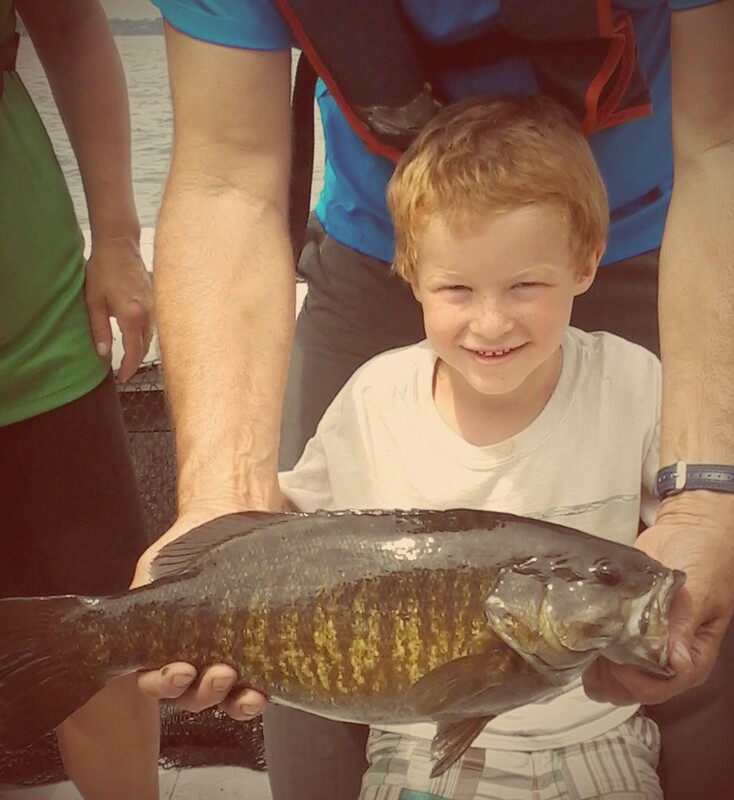 A fish known to inhabit the deeper waters of Lake Ontario. 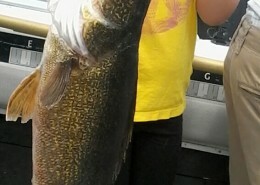 John swears it was the biggest fish he had ever seen, and my wife thanked God we didn’t have to bring it into the boat. Much to all of our surprise however, we weren’t through with it yet. Not 15 seconds after breaking off my line the rod to my right began to scream out line. John, the first to react, surmised the Musky had become hooked on a second rod. He pulled it from the holder and again handed me the rod. What was I to do, but finish the job. Unfortunately for the Musky it still had the crankbait from my first line in his mouth. One of the hooks must have become wrapped in one of the other lines being trolled behind the boat. Yet again, I was dealing with several hundred feet of 10-pound monofilament line. This time however, the Musky had no intention of joining us on a leisurely stroll, and was instead heading off in a perpendicular direction to our own. For the next 15 minutes I worked on slowing down its progress. Suzette even altered course to parallel the Musky’s direction. In the end though, it wasn’t enough, and with another strong surge, the Musky cleared itself of the line. The final departure of such a large Musky from our grasp left us with mixed emotions. We felt bad that such a large fish was now adorned with a crankbait with two treble hooks, although research on this issue tells us that the fish would be free of the bling within three to five days. We also all wanted badly to have landed the Musky, but none of us had any idea of how we would have managed to complete this aspect of the fight. 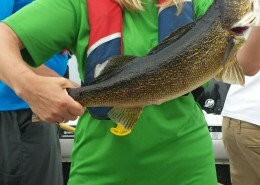 In reality, the best we could have hoped for was a quick and easy hook release with the fish beside the boat. If not a complete release, then Cutting the hooks at best, or worse case scenario, cutting the line. There was no way we had a net anywhere near large enough to fit that fish without causing it significant injury. I can say here with all honesty that I lost what would have been the largest Musky of my life. Keep in mind this isn’t my estimation, having never actually having placed my hands on the fish to determine through touch alone its actual size. No, I’m going strictly on what others in the boat observed with their own eyes. It was most definitely a musky that everyone saw leap three times behind the boat, with an estimated length that easily exceeded 55 inches. For me to have experienced such a fish for over an hour on what would arguably constitute tackle that was far too light, was an experience to say the least. Honestly, I doubt the fish even knew it was hooked until it had grown tired of following what it had likely misunderstood to be pray that simply refused to give up the fight. It wasn’t until it tried to spit the bait and couldn’t did it panic resulting in it shooting up to the surface to shake off what it now understood to be a threat. Some might muse that perhaps I overly tired the fish, but in my defense, the light line and drag setting never did allow me to actively engage the fish in a battle for its freedom. While interesting, in no way could the hour we spent connected to each other by means of first one and then another thin strand of monofilament be considered an epic man versus fish struggle for supremacy. In reality, it was more like the Musky had assumed the role of guide fish for the blind, and had simply joined me for a leisurely stroll. Later in the day, after being driven off the lake by threat of lightening, I don’t think there was a single one of us who didn’t feel somehow different. Most certainly the hospitality and comradery was top notch and the fishing first rate. However, swimming in each of our consciences was an extremely large Musky that played us more so than we it. We were little more than a play toy to a rather large apex predator. A fish that new most certainly it had nothing to fear. Without exception, we were all left feeling awe inspired and humbled.